When Music Director, Carol Kozak Ward founded the Colorado Hebrew Chorale (CHC) in September 1993, there were no choirs in Colorado dedicated to Jewish music in all its facets. The establishment of the CHC filled a niche, providing area choristers a place to learn and share this unique repertoire with diverse audiences, and enriching the local cultural landscape. Since our inception, CHC has had a long and successful history of collaboration with area organizations. These include other choirs and performing organizations, churches, synagogues, museums, schools and libraries. These collaborations have furthered our ability to offer our distinct music and educational message to the public. In 2003 CHC was welcomed as a Tier III member of SCFD, the Scientific and Cultural District. In 2013 the Colorado Hebrew Chorale launched Kol Nashim, literally “Women’s Voices”. This SSAA choir, directed by Leah Peer, was established to enlarge our membership base and audience reach. Both choruses are made up of amateur singers drawn from all areas of greater Denver, representing the diversity of the community. Singers of all religions, races and gender identities are welcome. Music is a widely recognized vehicle for building bridges, whose power to inform, engage and educate is unsurpassed. 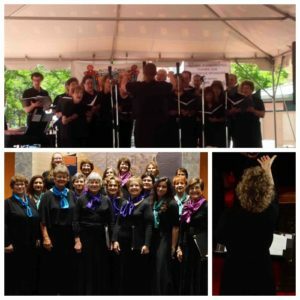 The Colorado Hebrew Chorale’s two choirs offer Jewish holiday concerts, providing exposure to unique repertoire and content to under-served populations. We are the only community choirs in the Rocky Mountain region who offer this kind of programming. Additional performances bring awareness of select societal issues to the general population through music, multi-media presentations, and audience participation, putting a face on “the other,” and creating familiarity. The choirs of the Colorado Hebrew Chorale have maintained a commitment to multicultural outreach since our inception. Promoting a more civil and just society through music has been a motivating factor in our organization’s programming, by means of repertoire selection and presentation. We work to raise awareness of the issues affecting battered women and children in the hope that we will reach some of these victims and give them information on how to seek help, as well as encourage community involvement in eradicating this problem. The focus of “Hear My Voice” concerts is to harness the power of music to inform, and to raise funds in support of programs benefiting battered women and children in Colorado and abroad. Because the choirs of the Colorado Hebrew Chorale view community service as a primary component of our organizational mission, our performance season looks different from other community choirs, and is not limited to a set number of performances per year. For the past 24 years, the choirs of the Colorado Hebrew Chorale have been seen as a consistent supplier of quality Jewish music programming. Throughout the year, we are approached by various organizations requesting our services, and we strive to provide programming for as many as we are able, within the restrictions of funds raised and ability of our singers to commit of their time. Typically, we offer 12 to 15 performances in a calendar year, reaching 3,000-4,000 people. Each season we seek to reach audiences through new around the state.